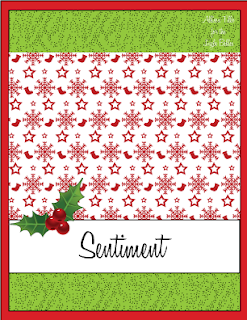 This time at ♥JINGLE BELLES♥ we're making cards which are not square or rectangular, so fire up your silhouette, break out the die cuts or, for those of us who are "old school", dust off those templates! Think round, triangular, heart-shaped, tree-shaped, stocking-shaped, gingerbread house, candy cane, Santa's sleigh... or, well... your imagination and your scissor-skills are the only limits! 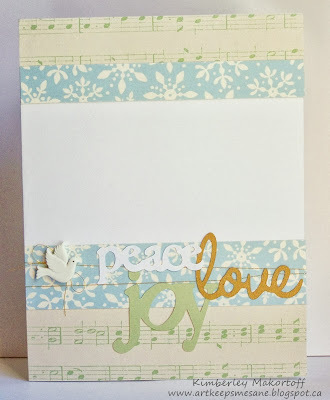 Stephanie says, " I chose my favorite Labels 20 Die Cut for my card base shape. I adhered four 3-inch squares of designer paper to a cardstock scrap before centering my die cut and rolling through my Cuttlebug. 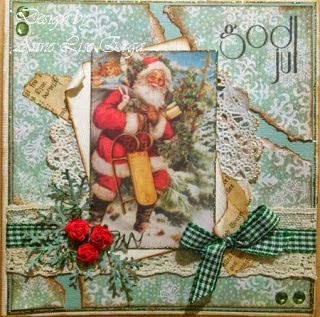 Papers & chipboard Santa are from Basic Grey's 25th & Pine Collection and sentiment is an EAD Designs sticker. 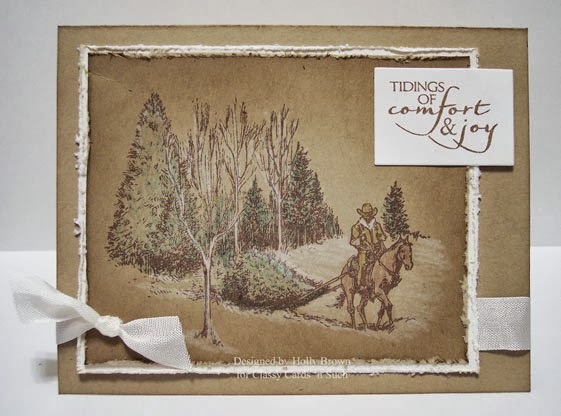 The Sketch is from the Weekly Christmas Card Challenge." Lauren says, "My go-to strategy for shaped cards is to choose simple forms and paper-piece them. 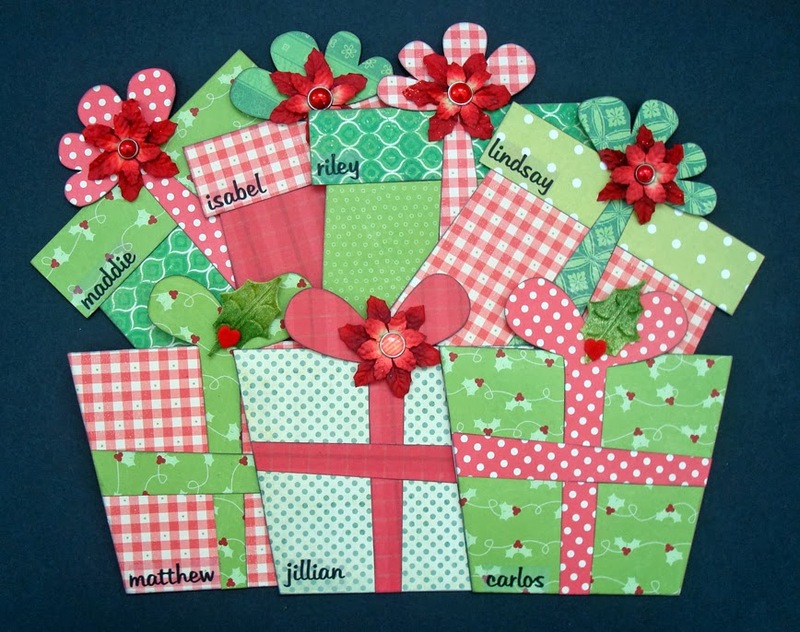 These pretty packages are based on some from a retired digital elements kit by Mindy Terasawa, called "Jolly Lil' Friends". I printed one of each present onto cardstock at my desired size (approx. 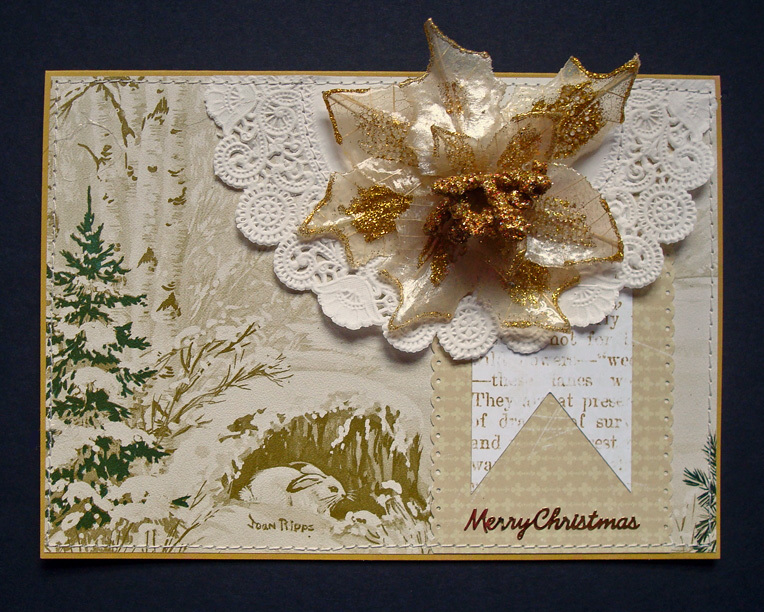 5x6") and then used them as templates to cut the gifts and bows from scraps of patterned paper. The result is a unique--but similar--card for each of my nieces and nephews; kind of like kissin' cousins!" 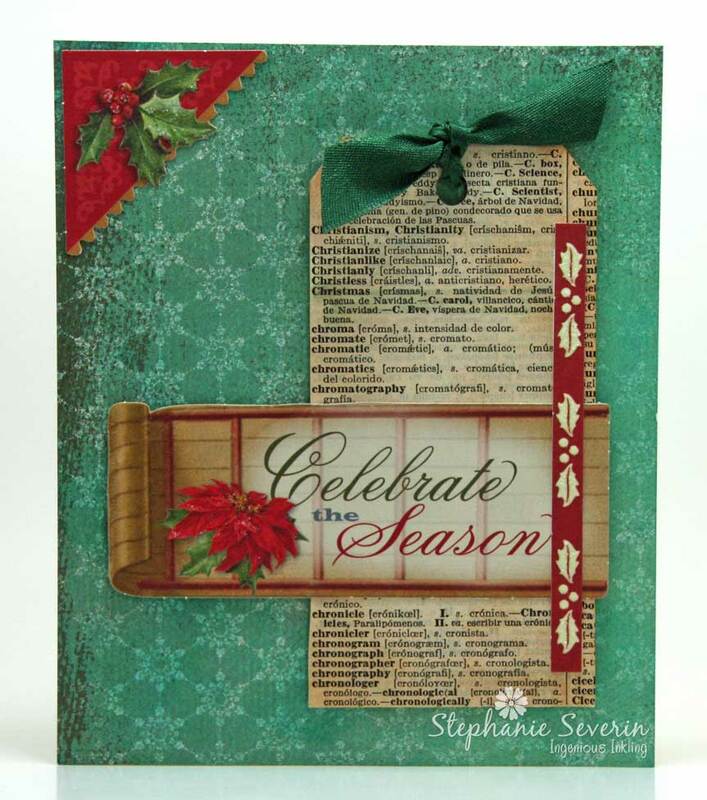 Link up before 6pm (EST) on Wednesday, October 9, 2013. Keyword for galleries and the flickr group is JB:13:20. 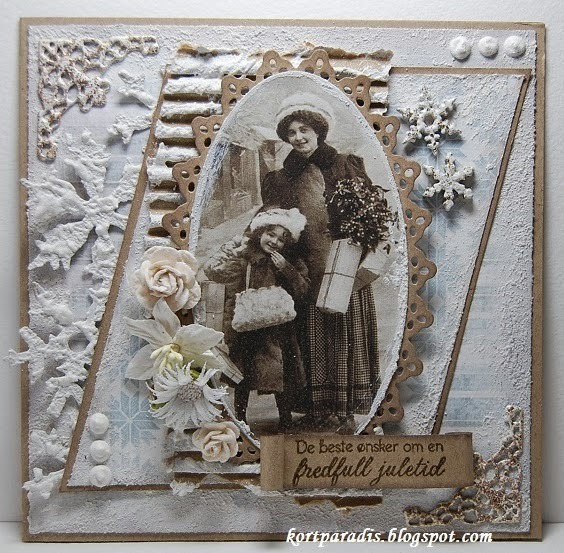 Created a winter card paradise which includes a beautiful vintage image, tons of lovely texture, and oodles of gorgeous flowers! Put Currier and Ives to shame with this astonishing display of stamping and coloring on that perfect kraft background! 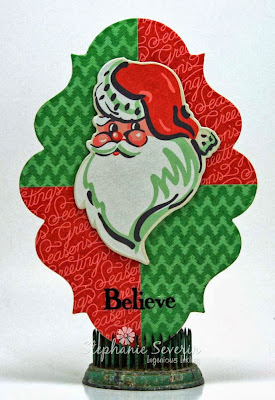 Combines the perfect vintage Santa image with a boatload of inking and distressing talent to combine the old and the new flawlessly! Please contact us at jinglebellesrock @ hotmail.com to claim your prize! 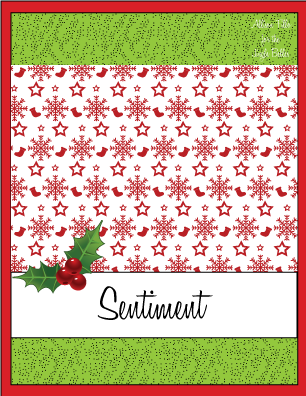 Many thanks to everyone who played along, we ♥LOVE♥ seeing your gorgeous work! Be sure to stop back at midnight when we've got a prompt guaranteed to whip your holiday cards into shape! 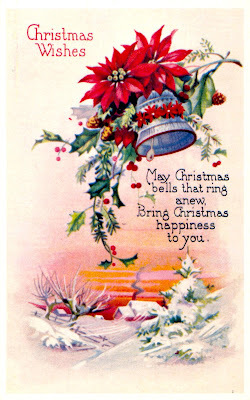 Lauren says, "If I could only have *ONE* source of vintage holiday images, I think I'd choose the stack of 1960's Christmas Ideals magazines that my uncle's mother, Georgia, lovingly saved for many years, and which he gave to me after she passed away. This pretty nature scene was actually the off-cut from an image i used a while ago, but the sweet little rabbits were just too cute to toss away. My layout is based on Sweet Sunday Sketch #173 which would be brilliant in any case, but was especially useful here, in allowing my strategically placed doily to cover a hole at the top of the image!" Stephanie says, "I combined true vintage (a dictionary page from 1931 on my tag) with vintage styled embellishments from K&Company (love that sled). The layout is the September Reverse Confetti Sketch for You to Try." 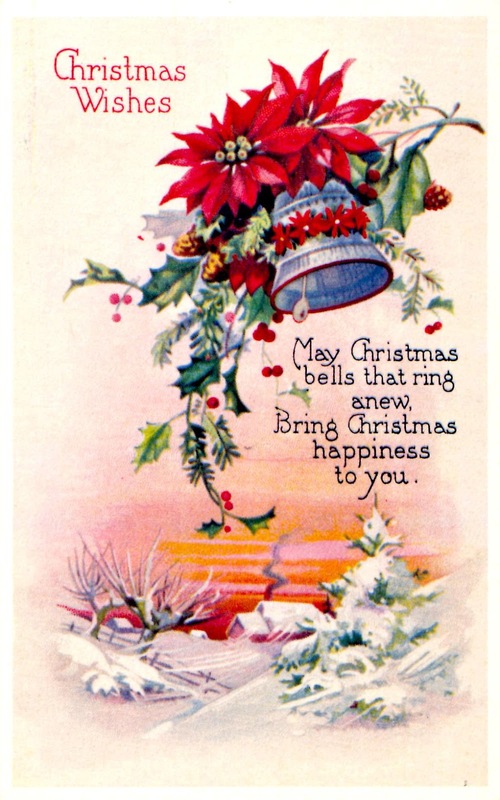 Stephanie says, "I scanned a vintage holiday card for my base (I search for them whenever I'm at flea markets, especially ones with fun colors & illustrations like this one). 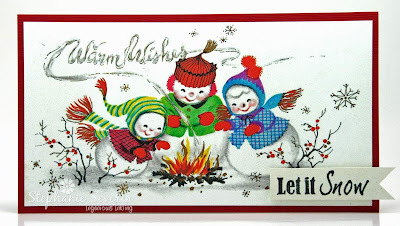 I removed *from the three of us* from the scan and added a *Let it Snow* sentiment from Christmas Magic for a clean & simple vintage design." 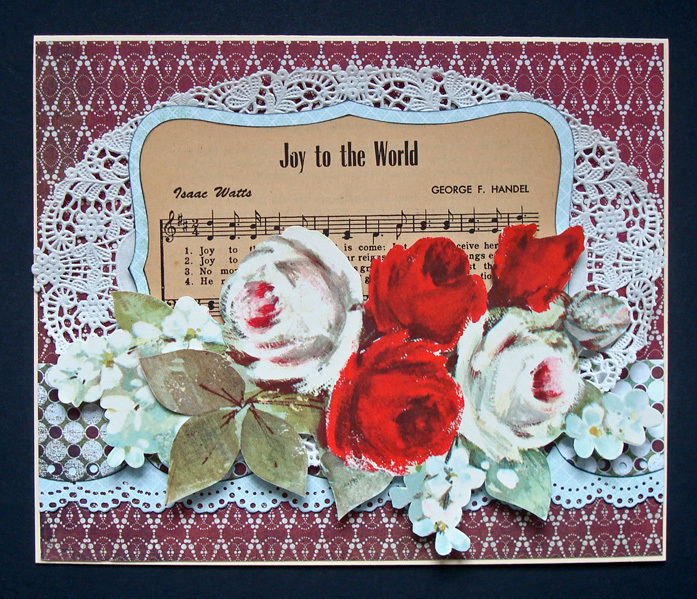 Lauren says, "I used a slightly scaled down version of the 'Joy to the World' sheet music scan, as well as a floral bouquet cut from some vintage gift wrap, and a doily that I found in a box of garage sale goodies. 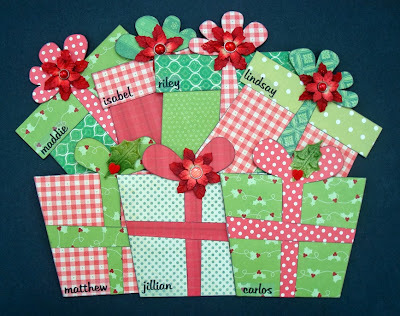 I rounded out with mats and strips of patterned paper that I thought coordinated well with the gift wrap ...et voila! Another card for my 'Sane December' stack!" 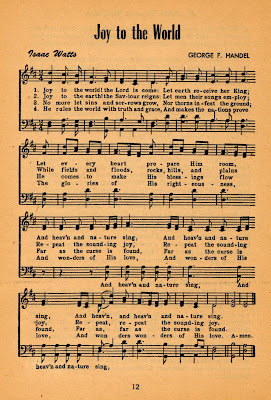 "Hi ♥JINGLE BELLES♥! 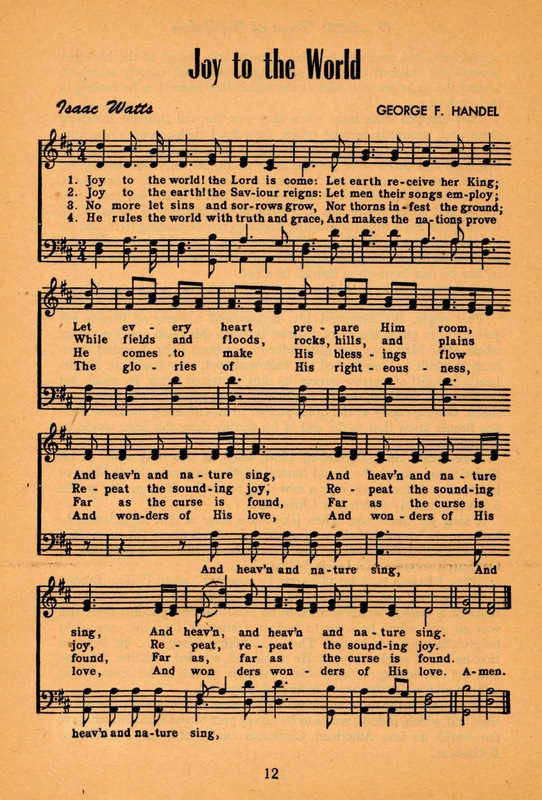 You probably already know how much I looooooove to collect vintage paper goodies, from sheet music to postcards, to funky magazines, books and sewing patterns... if it's old and made of paper, chances are I have at least a little bit! My Etsy shop, Just Enough Stuff evolved out of the realization, a couple of years ago, that whereas *I* have far too many lovely bits and bobs, other folks might not have any! Thus I decided to try to even the balance by making the extras into fun ephemera packs... so we could ALL have Just Enough Stuff! 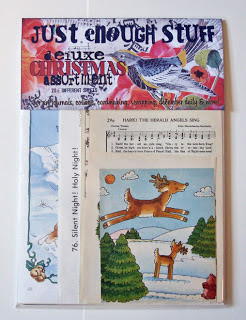 One randomly selected card-maker who links up with us this fortnight will win one of my special Christmas Ephemera Assortments (like the one pictured above) and also a $10 gift certificate to spend at Just Enough Stuff! Good luck and have fun!" We loved all of the wonderful takes on the oh-so-great sketch from Allison Fillo ... here are a few we chose as Sketching Superstars. featured these fabulously colored *jingle balls* (seriously, how could we pass on jingle balls) ... love the crocheted embellishment too. 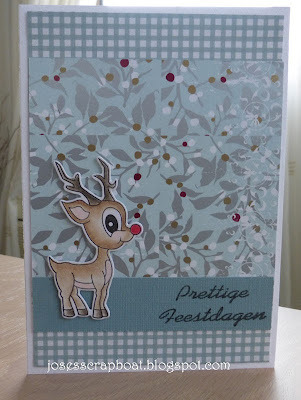 combined three different monochromatic papers with this adorable little reindeer ... love that red nose and how the little bit of white around him makes him pop against the patterned background. 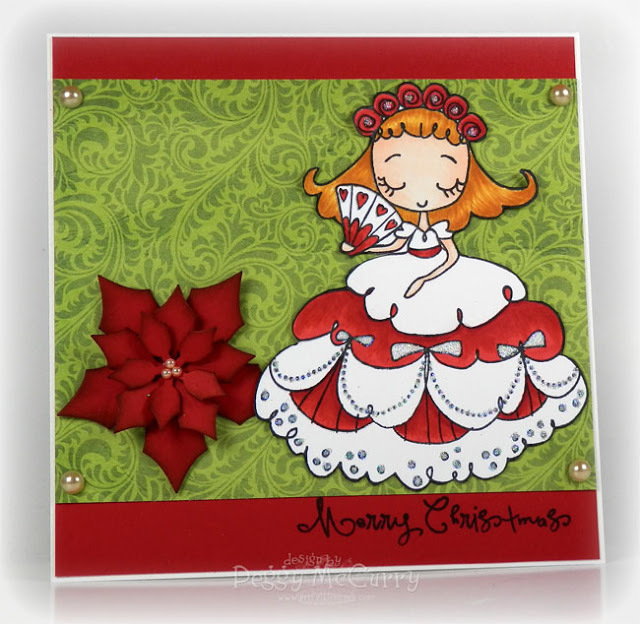 featured the pretty queen of hearts dressed in her finest holiday gown ... gorgeous shading on the poinsettia ... and the perfect touch of Christmas sparkle. Kim - e-mail us your mailing address & we'll get your goodies in the mail. And join us at midnight for another fun holiday card challenge (and perhaps yet another chance to win some awesome goodies). We're back for another week of fun Sketch Cards ... with our lovely layout brought to us by Allison Fillo. Stephanie says, "I went monochromatic with Pantone's Emerald, one of the Spring 2013 fashion colors. 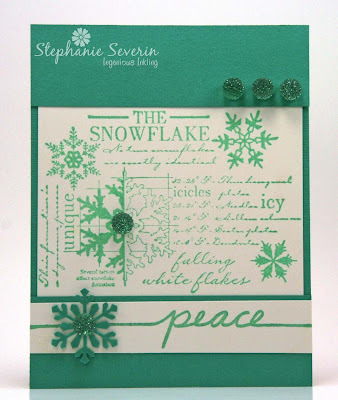 I used Snowflakes & Peace Stamp from Crafter's Compaion together with some big emerald bling." Lauren says, "In addition to having a *FABULOUS* sketch, there's nothing more fun than having new goodies to tap into when looking for inspiration, is there? 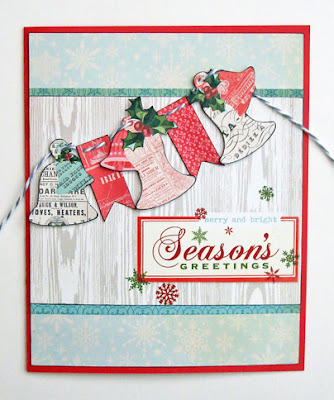 I got some awesome bargains during Crafty Steals' "Christmas in July"; here I'm test-driving my new Pink Paislee diecut banner shapes and a Studio Calico Journaling card, mixed together with papers, rub-ons and twine from my stash!"